What it’s about: In 1892, a water meter factory opened in Queens. 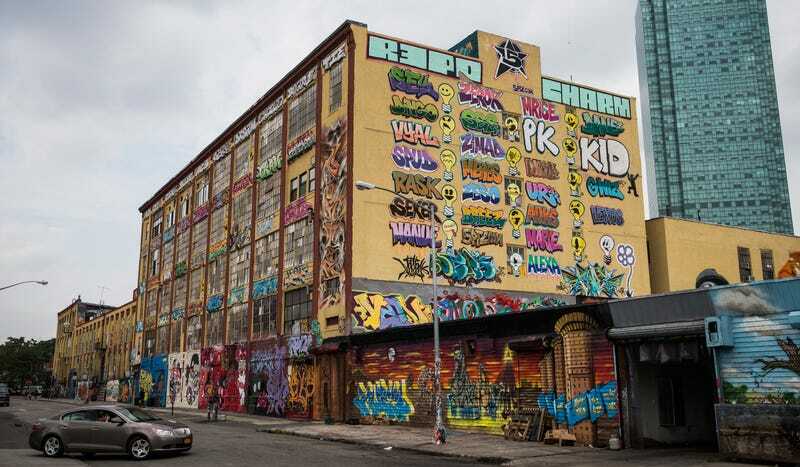 A century later, the long-since abandoned building was converted to artists’ studios, and pre-gentrification New Yorkers turned it into a five-story monument to graffiti. Post-gentrification New York, however, had other ideas. Biggest controversy: For this, we have to start at the end of the story. Jerry Wolkoff, the factory’s owner, had rented the interior of the building to artists and allowed graffiti on every surface of the exterior for 20 years. But in 2013, he made plans to tear down the building and replace it with condos, as part of a larger ongoing movement to tear down the entire city of New York and replace it with condos. The art community protested, and Wolkoff whitewashed the building overnight, destroying the artwork. By the following year, he had demolished the building. The artists fought back. An appeal to the NYC Landmarks Preservation Commission failed, as the art was less than 30 years old and therefore not deemed historic. Despite protests, the city council unanimously approved Wolkoff’s development plan, which included affordable housing and even space for more curated graffiti. A petition to stop the demolition failed. But one effort succeeded—a coalition of artists sued over the whitewashing, arguing that the law required 90 days’ notice before the art could be destroyed. A jury agreed, and awarded $6.7 million to be divided among 21 artists. Thing we were unhappiest to learn: We don’t really get the end of the story. Wikipedia only takes us as far as early 2017, when the condo development was, “expected to be complete” by the end of that year. While the new buildings have nods to the site’s past—there are 20 art studios alongside 1,115 apartments—it’s hard to tell exactly how the new building straddles the fine line between homage and exploitation. Renderings of the as-yet-unbuilt interiors show “murals representative of the old building’s street art” and an “engraved graffiti logo,” but no indication of whether any of 5 Pointz’s original artists were invited to create those murals, or whether their style was just copied to make the luxury condo owners feel hip. Also noteworthy: It’s perhaps unsurprising that such a striking location has been used again and again as a cinematic backdrop. Besides hosting the climax of Now You See Me and the series finale of Rescue Me, it’s also been in a ton of music videos. Hilariously, Wikipedia’s list of “hip-hop and R&B stars” includes hip-hop legend Joss Stone and R&B great Joan Jett, at the tail end of a list of actual rappers like Doug E. Fresh, Kurtis Blow, and Mobb Deep. Best link to elsewhere on Wikipedia: In between water meters and graffiti, the 5 Pointz building was home to a record manufacturer that made CD covers and 8-track tapes. The obsolete, unlamented 8-track was a less-than-ideal format—for starters, you could neither skip tracks nor rewind/fast forward, which meant you could only listen to a full album, in order, and if you wanted to hear your favorite song again, you had to wait for it to come back around. They were also bulkier than later cassette tapes, and more likely to break. But the defunct format has a surprisingly rich history—8-tracks were developed by the Lear Jet corporation, working together with RCA Victor, Motorola, electronics company Ampex, and Ford and GM, which brought the tapes to prominence by putting 8-track players on car dashboards. 8-tracks were used in early karaoke machines, and the format survived at radio stations until the late ’90s, as a short, endlessly-repeatable tape loop was ideal for station IDs, jingles, and commercials. Further down the Wormhole: Joss Stone cemented her place on a list of hip-hop greats in 2005, when her cover of the Beach Boys’ “God Only Knows” was used in a Gap commercial. Once called the most “perfectly constructed song in pop history,” it’s been covered by countless artists, perhaps none more unlikely than The Langley Schools Music Project. We’ll take a look at the greatest elementary-school pop group ever recorded next week.